Cleaning Up the Mess is here to make sense of what just happened at your weekend-long television party. Who put Goldfish in the blender? And why is the thermostat on 42? This week: Bret Bielema talks a whole lot of mess about your floor plan then learns that his house is on fire. Notre Dame struggled to take the lid off the pickle jar and dropped it in the floor again (it’s okay, grandpa. You just sit on the couch and watch more TV, ok?). Oklahoma beats a 14-year old at Battleship and proceeds to flip over the game board with it’s middle finger. Revenge is suggested as one of the central lobes in the brain of a Michigan State Spartan in ESPN’s latest commercial for the College Football Playoff. 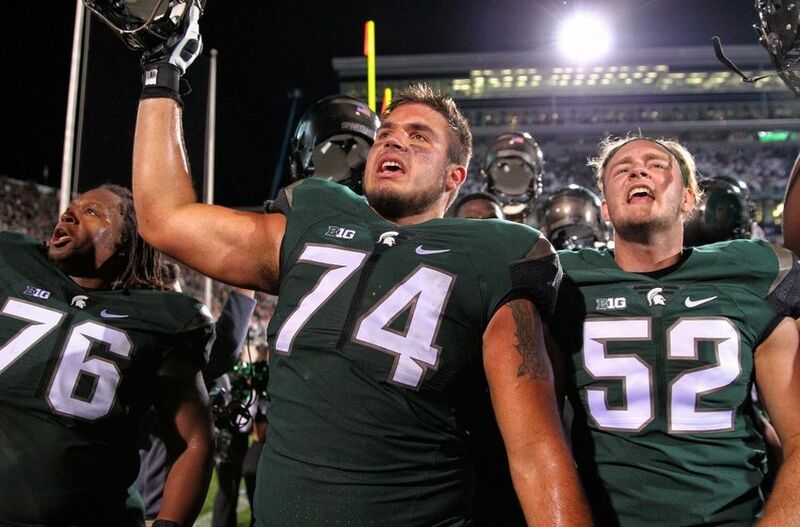 Last year, the Spartans were torched by both Oregon and Ohio State as they entered the 2014 season with high expectations following an unlikely run to the Rose Bowl in 2013. They grabbed victory against the Sour Grapes of Baylor in the Cotton Bowl as a consolation prize. This year, the Spartans’ path to a playoff is no different than the last: Beat the Ducks and Bucks, then everything else is gravy. Revenge shouldn’t be the central lobe; revenge should fill up the whole damn cranium. On Saturday night, the Spartans checked off one of their big name opponents by stifling the Ducks in a way that their 2014 selves couldn’t. The defense was able to contain Vernon Adams and Oregon’s offense through a high-pressure pass rush that left Adams lobbing balls deep past his own receivers. The biggest incompletion of the night came from a 4th-and-16 attempt which saw Adams sail a pass right over Bralon Addison to win the game in the fourth quarter. The Spartans defense looked more immovable than their billing last year by holding the Ducks to just six successful attempts out of 19 3rd/4th down conversions. They were also able to force two interceptions out of Adams while sacking him four times en route to a 31-28 victory over the Ducks. While the Spartans didn’t play the most stifling defense imaginable (MSU gave up 309 passing yards), there is enough evidence to suggest that they could hold Ohio State’s superhuman offense in November. Even if the defense has its share of breakdowns, the Spartan offense looks capable of bouncing back. After a beautiful opening possession by the Ducks that ended in a touchdown, Michigan State responded in kind with a 62-yard run from redshirt freshman Madre London that set up Connor Cook with a 12-yard pass to Josiah Price. The two teams later traded blows in the fourth quarter when the ducks put the game within three with only 3:48 remaining. Again, Michigan State responded with a 65-yard drive that was topped off by a 38-yard run from LJ Scott to put the game out of reach by ten, until Oregon came roaring back for a failed last minute attempt. The Spartans do have a fair amount of work to do before they cross the next name off of their revenge list. The special teams units left a little to be desired, and the “No Fly Zone” looks like an open airspace. They are especially going to be tested on their offensive line with the possible loss of right tackle Kodi Kieler, who left the game with a knee injury. Yet, with a win over a top-ranked Oregon, the path to the Playoff got much, much easier. Near misses seemed to be the theme for the day in college football, most of them happening within the SEC. The most highly televised of them being Oklahoma’s come from behind victory against Tennessee in a rowdy, hostile Neyland Stadium. Tennessee’s ascension back into national relevancy since Philip Fulmer’s dismissal in 2008 has been full of false starts. There was flashes of promise in the short-lived, gossip rags era of Lane Kiffin. Derek Dooley was all potential and no payoff leading up to games with Alabama, Florida and Georgia. Butch Jones, however, entered at a time when expectations for the Volunteers reached an all-time low. Jones was hired to rebuild Tennessee and, in his third year, there’s been some high hopes that this year would be the year in which progress would finally show. Yet, the Oklahoma game in friendly confines was a disheartening affair that resulted from a huge defensive collapse by Tennessee. For three quarters, the Volunteers looked poised to shut down the Sooners all night. The defense swallowed QB Baker Mayfield; the first drive resulted in an interception from the highly touted quarterback. Tennessee’s secondary beat up Oklahoma’s receivers for most of the night with DB Todd Kelly Jr. leading the charge (who recorded both of Mayfield’s interceptions). Sooners WR Sterling Shepard was put on an island for most of the night until the fourth quarter. After holding Oklahoma to just three points, the defense broke down when the Sooners started to throw short passes and use RB Samaje Perine for five-yard runs. The Sooners eventually eeked their way into the end zone twice in the fourth quarter to tie the game and force overtime overtime. From there, Oklahoma’s defense, which made sure Tennessee topped out at 17 for all of regulation, came up big. They shut down Vols QB Josh Dobbs and stuffed Jalen Hurd at the line of scrimmage for a 31-24 victory in double overtime. The result was a hard pill to swallow for Tennessee, especially when the loss came with a fun middle finger to boot (with a subsequent reenactment of NBC’s The Slap by Butch Jones). The signs of progress that those in Knoxville were looking for were there but the beaming ray of hope that came along with them was quickly shaded by the giant specter of Big Game Bob. There is potential for this team to go 8-4, as each team in the SEC East looks more and more impotent in out-of-conference games. For now though, this is going to sting. The Sooners, on the other hand, are in their true September form. They are beating out contenders when all odds are against them and also hiding most of their problems under eye-opening wins. One of their problems though was in plain sight under the name of WR Joe Mixon. You might remember Mixon from his suspension in 2014 due to an assault case in which he allegedly punched a female student in the face. This was all caught on camera, but the public won’t see it, of course. The Sooners are just treating this thing like they treat their team weaknesses in September: by sweeping it under the rug. On the other side of the SEC, things looked hairy in the Plains, as Auburn barely managed to squeak out a win over the Jacksonville State Gamecocks in overtime. The Tigers struggled on defense against Jacksonville State; they allowed 438 yards of total offense and two touchdowns. Also, Auburn QB Jeremy Johnson threw two more interceptions to add to his season statistics. Auburn escaped one of the biggest upsets in college football history though. Theoretically, they can still make the playoffs. The same can’t be said for the Arkansas Razorbacks, who took an absolute nosedive against the Toldeo Rockets. The Razorbacks went into 2015 with a lot of praise and a lot of hope that they may be the third best team in the division. Those are good stakes, especially when Arkansas has been the resident punching bag in a very deep SEC West. The minute head coach Bret Bielema starts yapping on and on about strength of schedules is when things fell apart. You’d think the Bielema family would know a thing or two about karmic forces by now. Arkansas’ potent rushing attack was held to 103 yards while QB Brandon Allen was trying to claw his way out of burlap with 412 passing yards and a touchdown. Toledo, however, held the Razorbacks to 5 successful conversion attempts out of 13 on 3rd down. They also held Arkansas to just ten points despite the fact that the Razorbacks were in the red zone five times. David Shaw is looking at that kind of efficiency and welcoming Bielema to the club. With the fall of Arkansas and the near stumble of Auburn, the SEC West looks very top heavy with Alabama, Ole Miss, Texas A&M and LSU now poo pooing everyone else below. There might be a clearer picture of the division evolving next week when Ole Miss heads to Tuscaloosa to take on the Tide. But Auburn, Arkansas and Mississippi State all have a lot to do in order to try and vouch for the division crown. BYU’s Tanner Mangum had another last ditch pass in the end zone to beat the 20th ranked Boise State Broncos. While it wasn’t a half field lob, and there was still some time on the clock for the Broncos to win, the all-or-nothing 38-yard pass sunk the morale of Broncos fans everywhere. The ensuing Boise State drive afterwards resulted in a pick six which sealed the game for the Cougars. Now, BYU might be headed for a nice spot in the Top 25 for Week 3. After looking like a colossus-beating titan against Texas, Notre Dame went to Virginia and stumbled assbackwards into a 34-27 win over the Cavaliers. It did so while unfortunately losing QB Malik Zaire for the rest of the season with a fractured ankle. Their backup DeShone Kizer stepped in and was able to bring the Irish back after trailing 27-26 in the 4th Quarter. Kizer hit WR Will Fuller for a 39 yard pass that locked up the Irish victory. Notre Dame’s next two games are against much tougher opponents in Georgia Tech and Clemson. Though Kizer may have been able to come through in the clutch, it remains to be seen if he can pull it off twice. LSU beat Mississippi State 21-19 in Davis-Wade Stadium to kick off division play in the SEC West. The Tigers were led by sophomore RB Leonard Fournette, who had 159 yards of rushing and three touchdowns. The defense for LSU is still staggering as they held the Bulldogs to just 378 yards of total offense. 335 of those yards coming from Dak Prescott’s throwing arm. While LSU proved more than capable of stuffing the run, their weakness in the secondary leaves much to be desired as they look to take on a pass happy Jeremy Johnson and the Auburn Tigers next week. UCLA QB Josh Rosen had a decent game against UNLV in the Bruins’ 37-3 victory; Rosen threw for 223 yards, a touchdown and an interception. The gaudier numbers of the game were in the running game, led by RB Paul Perkins, who racked up 151 rushing yards and two touchdowns. If the Bruins are a little shaky with Rosen behind center, it’s nice to know that Perkins can pick up the slack otherwise. Ole Miss put 73 points on Fresno State and held Fresno State to 21 points. They are one of the most high scoring teams in the SEC West right now and they look more and more frightening from week to week. If you don’t have Ole Miss-Alabama circled for next weekend, you are absolutely not doing this whole thing right. Utah forced two interceptions out of the offensive bullet known as Chuckie Keeton of the Utah State Aggies. The Utes beat the Aggies 24-14 but not before losing Travis Wilson to a left shoulder injury. The Utes’ dream to wreck the Pac-12 South are still a likely aspiration but it hurts to lose a starter like Wilson. Georgia throttled Vanderbilt 31-14 in Nashville. Nick Chubb put up 184 rushing yards against the Commodores en route to the victory. The only notable thing from Vanderbilt in this game was a bobbled punt that managed to elicit a “WHAT THE HECK?” from Verne Lundquist. Jim Harbaugh came home to Michigan and punched Oregon State in the mouth. That’s all you really need to know.